Laura Sassi gives a delightful twist to the popular bible story of Noah and the Ark. Without losing the essence of the original story, she weaves humor and rhyme into the first bedtime routine on the ark. Jane Chapman’s illustrations are childlike, bright and playful all while expertly lulling little eyes to sleep… zzzzz. Whisper now, what more could a parent want? What a beautiful story! So much fun to read and share with little ones. Feel the calm before the storm, frolic with the frightened animals, rest assured that you are never alone. Goodnight sweet ones…. 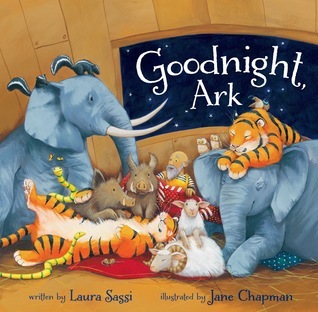 Just found this lovely YouTube picture book trailer for Goodnight, Ark. Take a look, I’m sure you’ll love it! All the sleepyheads have snuggled in for the night, each in their own little bed. One is in a nest, one is in a hole, one is in a cave. In the trees, lake, and barn all the sleepyheads are sound asleep. (Except the owl who slept all day!) Then with one more place to look for sleepyheads, the reader goes inside the house and finds one beside the fireplace and another in a dark space, but when we get to the bedroom someone is missing from his bed. Where is he? In his Mama’s arms! Goodnight sleepyheads. 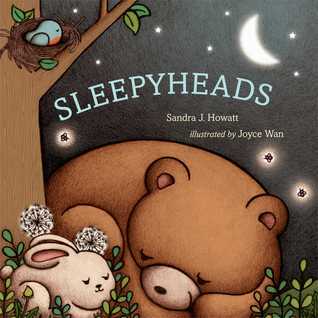 Sandra J. Howatt’s first picture book is soft and sweet and sleepy. The quiet movement from the woods, to the lake, to the barn, and then to the house is perfectly paced. Like a lullaby, this book is written in sleep-enducing rhyme and rhythm. Joyce Wan adds the beautiful illustrations to the text. The pictures are also soft and sweet and sleepy. Starting with the crescent moon and stars in the dark sky, the reader is immediately transported into that pre-sleep state of consciousness which ends in Mama’s arms while fireflies light the dandelions. What a perfect bedtime story! I love everything about it. The text and illustrations dance together in the evening music, lulling tired little eyes to close and sweet little heads to nod. This is a simple bedtime story of a reader (parent, grandparent, auntie, brother, etc) telling the listener how much he/she is loved. 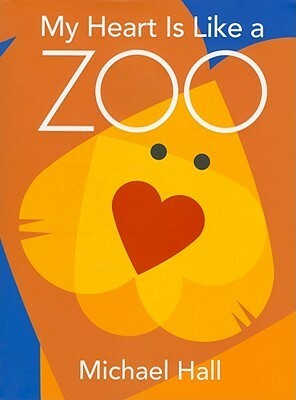 Each page depicts a different zoo animal with a phrase about the love shown by that animal for the child. After every two similes there is a rhyming third. The pages are illustrated with large and small hearts to create each animal. By the end of book, the reader shows the child as the zookeeper who is tired and has gone to sleep in his bed with all his toy animals around him. My favorite rhyme is ‘silly as a seal, rugged as a moose, happy as a herd of hippos drinking apple juice’. This is a perfect baby board book for the youngest babies to giggle with, learn new animal names, and of course chew on. It is also a perfect toddler book for older babies to mimic verses, identify animals, and read along with the storyteller. And upward, it is a perfect children’s book for young children to read independently, learn about similes, and recreate or design their own animal art. Did I just use the word ‘perfect’ three times? Yes, I did! And when you read it, you will find your own reasons to call this book ‘perfect’ too!